For more than four years, South Africans (those who follow the media) have been exposed to a media-driven debate on shale gas mining (fracking). Driven largely by Royal Dutch Shell and then Shell South Africa, the public has been exposed to false advertising and simple lies by the applicants to mine shale gas. The government has mismanaged this debate and its concomitant decision on behalf of South Africans in the most appalling manner. 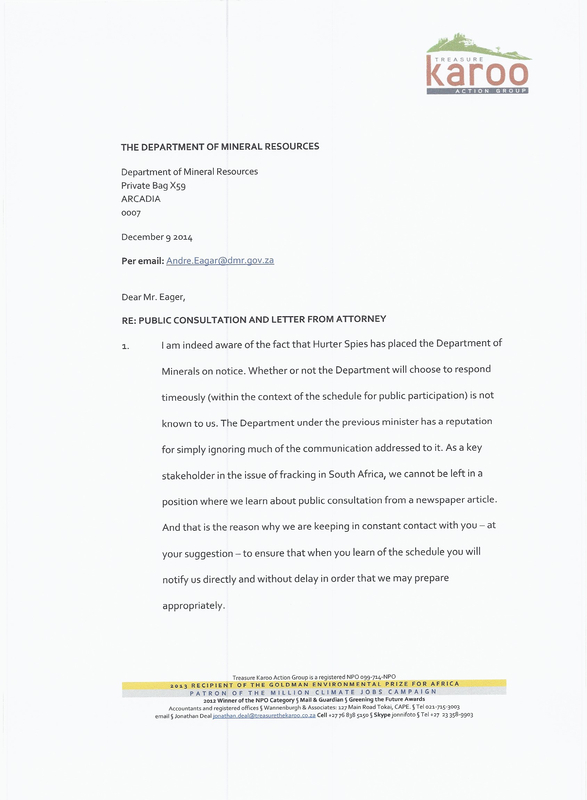 Quite apart from the fact that the ANC, as of January 2015, has an increased shareholding and interests in Shell South Africa, the Zuma administration permitted and even encouraged the previous Minister of Minerals, Ms. Susan Shabangu to sidestep the instructions of Cabinet, ignore any voices of dissent in the country and present, in September 2012, a so-called task team report on fracking that roundly fails to grasp even the rudimentary aspects and risks of the technology. At the time that the task team report pronounced fracking safe, not a single South African medical specialist had been included in the task team. In early 2014 President Zuma, at least 18 months before even preliminary exploration commenced, announced as if by some divine revelation, that fracking would be an economic game-changer for South Africa. 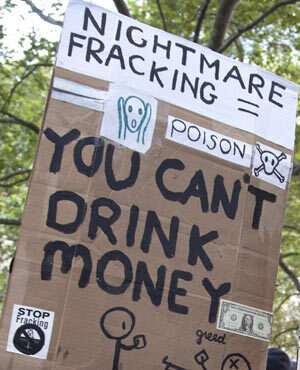 Meanwhile, around the world, the list of countries, states, provinces, cities and towns that are banning fracking or at least exposing it to some form of government moratorium or restriction is growing. In just December 2014 and January 2015, New York State, Scotland and the provinces of Quebec and New Brunswick in Canada have banned fracking, and Algeria has imposed a 7 year moratorium. Maryland is soon to vote on an 8-year moratorium. Notably, in the home country of Shell’s head office (the Netherlands), 71% of the Dutch Parliament placed fracking under an effective moratorium until 2017. The Canadian and NYS bans are especially interesting as they cited two main reasons – water pollution and health concerns; and the failure of shale gas mining to deliver the benefits promised by the industry. Against this background, ANC Ministers faithfully recite figures of jobs and revenue extracted from the Econometrix Report paid for by Shell SA and released in 2012. Notwithstanding the fact that the figures derived from the Econometrix report ignore any of the environmental and secondary costs of fracking such as impacts on eco-system services, farming and tourism (the model applied has been formally criticized by other economists) no one from Shell or our government has rectified the disparity between the 485tcf of gas and the acknowledged best case by South African Scientists of around 30tcf. This is a reduction of 13 times. Yet the 700 000 Shell jobs – based on a percentage of the 485tcf is still touted by Shell and the government. Global estimates of gas resources stem primarily from two sources – the Energy Information Administration (EIA) in the US and that country’s USGS (United States Geological Survey). Almost without exception the first ‘estimated’ gas reserves around the globe have proven to be roundly and routinely overstated. It was the EIA that estimated 18 billion barrels of shale oil from the Monterey Shale in California. This sparked a fierce debate in that State with Governor Jerry Brown vowing to pursue and extract the resource (much like President Zuma in SA). Even President Obama counted ‘at least 100 years of US energy from shale gas’. Less than 24 months later, the EIA had to admit their mistake and slash the reserve by 96%. Similarly, the Marcellus shale was slashed by hundreds of TCF. So, a clear picture is emerging in the global marketing of shale gas by the powerful oil and gas industry and their allies in governments around the world. Overstate the benefits to desperate governments. Promise energy, jobs, money and a false reduction of greenhouse gases. Once the momentum has built up and established a political will, use it to influence policy whilst ignoring science. In South Africa, our government, far from serving the people in this matter, is playing lapdog to Shell, while Falcon, Chevron and Challenger Energy tag along. World-class reports, (such as the Canadian Report) hand-delivered to our President, and to every MEC and Premier of every province are ignored. Public consultation by the government around the holistic concept of shale gas mining has not yet taken place in any form. Draft regulations on fracking, which were open for comment for 30 calendar days in 2013 were slammed by US scientists as ‘pathetic’. Although there has been no feedback from the government on TKAG’s 800 page submission, the government has promised to release ‘final’ fracking regulations ‘soon’. Our Bill of Rights and National Environmental Management Act are unequivocal on the issues of environment. Yet, the deck remains stacked against science. The government has instructed applicants (Shell, Falcon and Bundu) to remove any mention of fracking from their Environmental Management Plans, and so the new round of public consultation becomes focused on ‘exploration techniques only’ – no mention of fracking. This is misleading and disingenuous – but it permits the companies to get the process started and most likely to receive a rapid transition from ’no fracking in exploration until later notice’ to using fracking in exploration – and then a smooth roll-over into full scale production. Those who are opposing fracking in South Africa under the present circumstances are thus pushed into a corner. We can stand back and permit the tableau to play itself out – or we can take action. A solution to halting this headlong game-changer, game-changer rush of the government is for landowners to stand together. Even when the applicants are armed with an ‘exploration licence’ there are many administrative and legal hurdles facing them. A company armed with an exploration licence may not summarily enter your land, for any purpose. They have to consult with you at your convenience and negotiate access and a land-use agreement or similar accord. 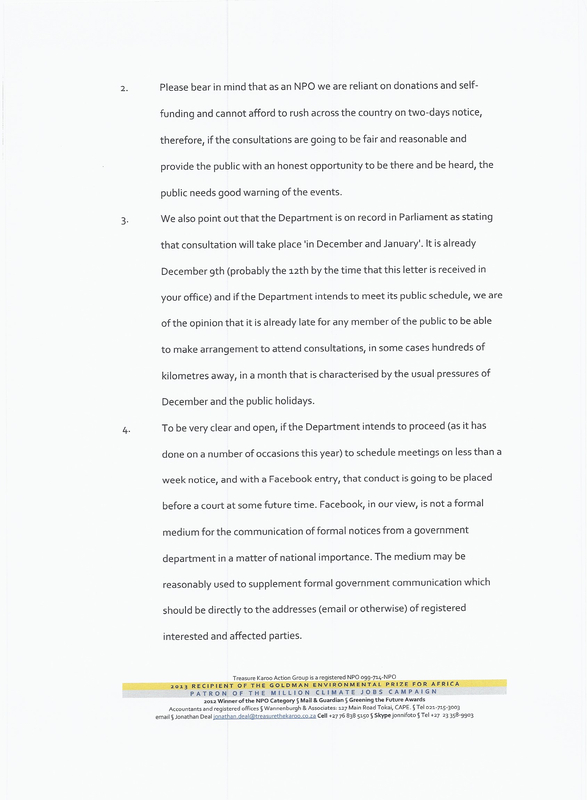 Demanding identification and a letter of authority/resolution from the person approaching on behalf of the applicant. Refusing access to the farm and referring them to your lawyer. Taking your time – their schedule is not your schedule – you are entitled to be fully aware of the import of each and every clause and condition and all of the possible negative effects on your operation. Putting them to terms about who will pay for baseline tests on your water, vegetation, livestock and staff health before any access and activity takes place. The key to this exercise, and the fundamental aim is to level the playing field – not be dishonest or deceitful. 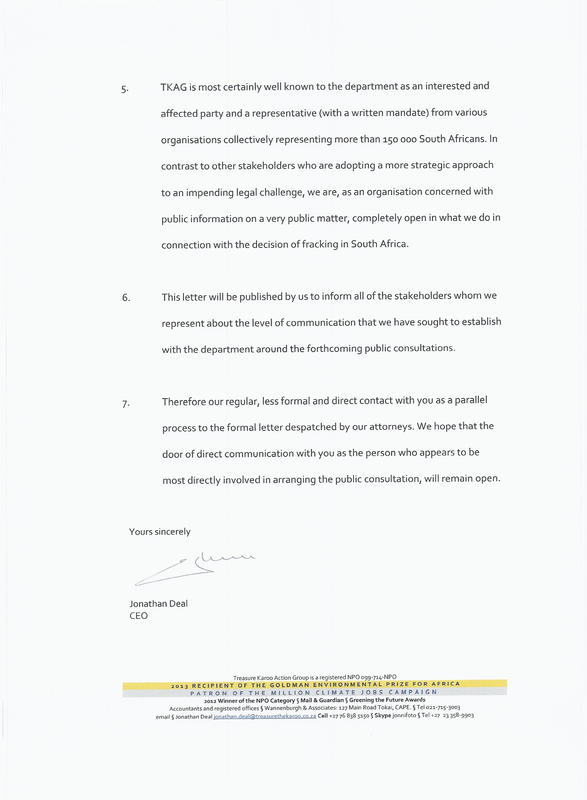 This is a straightforward, morally sound and legal remedy to a situation that is fraught with lies from industry and conflicts of interest in the very institution that should be protecting, instead of disadvantaging the food producers of South Africa. I hope that this synopsis has convinced you of what needs to be done, and I pray that you will stand up and stand together as a group to resist those who wish to rush shale gas mining into this country. Solidarity. For sustainability, truth and a future beyond the coffers of the ANC, Shell and foreign mining companies.